I am currently a student at the Royal College of Music, studying for my Masters. 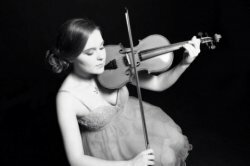 I started playing the violin at the age of 8 and continued my lessons at the Junior department of the Royal Welsh College of Music and Drama. I graduated from the advanced junior conservatoire course at the RWCMD in 2012. I am a member of several orchestras including the National Youth Orchestra of Wales, and this year was the principle violinist of the Royal Holloway University of London Chamber Orchestra under the baton of the prestigious Rebecca Miller. Winner of Caerphilly Young Musician of the Year 2012, and Caerphilly Rotary Young Musician of the year from 2009-2011. Other awards include the RWCMD prize for strings in 2012. I have been involved in many chamber groups and my current trio recently received coaching from members of the Badke quartet. I have experience teaching children as young as 5 and am always passionate about tailoring my lessons around the pupil's individual needs. I am comfortable teaching pupils of all standards and have experience working with pupils towards graded ABRSM examinations. I am always willing to tailor my lessons to my pupil's individual needs and am always enthusiastic to be teaching something that I am passionate about. I am very organised and plan the teaching and practice plans in advance of the lessons as to be able to use the time as efficiently as possible. My studies on performance science have allowed me to be able to give a unique approach to teaching, using latest research in performance to help my students achieve their optimum and maintain motivated to learn. LauraFrom Joanna (5/5): I am very happy with Laura she is the best teacher we had so far my son love to play violin again thanks to Laura . LauraFrom Anne (5/5): Laura is a very patient and encouraging, punctual, reliable and flexible tutor. Always smiling, with high standards and expectations. My 5yr old daughter really looks forward to her sessions with Laura. I am genuinely amazed at what my daughter can do after just a few weeks. We feel very lucky to have found Laura. Reply from: Laura: Thank you Anne, I really enjoy teaching Emilia and I'm glad she is doing so well already!